Over the years I’ve suggested that companies create a tradeshow-specific landing page for each appearance they make at a show. But frankly, I don’t see too many of them. But I recently ran across a tradeshow-specific landing page from Digimarc that caught my eye. Digimarc is a Portland-based company that helps clientele with product identification, labels, barcodes and the like. 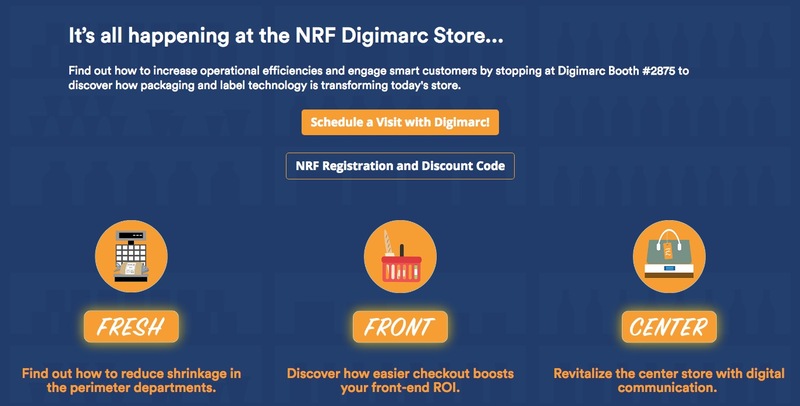 Digimarc has a tradeshow-specific landing page for their upcoming appearance at NRF 2018 at the Jacob K. Javitz Convention Center. Let’s take a look at their landing page and see what they are doing right. In the first screenshot, Digimarc starts off by everyone that they’re going to be at the NRF 2018. They mention their booth number and invite visitors to check out their store. In the third screenshot, Digimarc offers a chance to learn even more specific knowledge, with buttons to get better labels, implement easy checkout and engage consumers now. Finally, there is an offer to get a personalized language booth tour – when you click through, the options are to get a tour in Japanese or German – making it easier for those international visitors to make a connection with the company. Then there’s a Lyft voucher and (still to come) an NRF Survival Guide. It’s all capped off with an invitation to follow them on social media to continue the show connection. Everything is clearly marked, easily understood and very specific. The only quibble I have is that the date and location of the show (NYC in January) are not on the page. But you might argue that anyone going to the show already knows that information, and this tradeshow-specific landing page from Digimarc is being shared with people who are already aware. In any event, Digimarc did a great job with this. 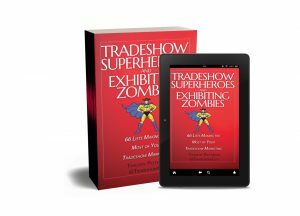 My question is: why aren’t you doing this with your upcoming tradeshow appearance?